Located along the southern coasts of Cambodia and into the Gulf of Thailand, Sihanoukville is home to about 200,000 people but with only three Buddhist pagodas, one Catholic church and one mosque. Buddhism reached Cambodia as early as the 3rd Century but sadly the historic Wats were built outside Sihanoukville. The majestic and legendary Angkor Wat is located in far-away Siem Reap and the often visited Temple of the Emerald Buddha is found in Phnom Penh, the capital city. The country’s official religion is Theravada Buddhism, which is the oldest surviving kind of Buddhism. Two of the Buddhist temples in Sihanoukville are Wat Chotynieng and Wat Utynieng. Wat Chotynieng is Khmer for “Upper Temple”, which is literally true since this pagoda is 132 meters above sea level. It is located on top of Sihanoukville Mountain, which therefore offers a magnificent view of the city, coasts, and surrounding waters. 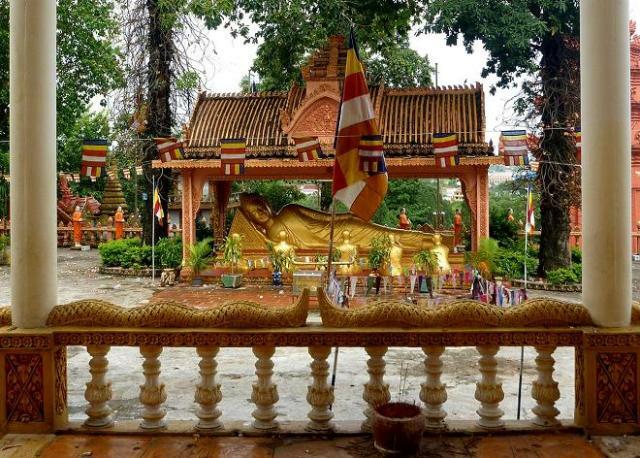 This is a very peaceful and sacred place; easily the most important pagoda in Sihanoukville. Being on top of a mountain has a lot to do with its tranquility and pervading reverence. Tourists are welcome here. In fact, the friendly monks are surprisingly very conversant. They enjoy chatting with visitors in English. In some cases, the elders go out of their way, mingle with the visitors and tour around those who are polite and respectful. Walking around a sacred pagoda on the highest peak of this Cambodian peninsula while engaging in a light conversation with a Buddhist monk elder is truly a once-in-a-lifetime experience. Inside the temple are many portraits of the Buddha in bright, lively colors. Those behind the sanctuary (or “vihear” in Khmer) represent the life of the Buddha. In front of the sanctuary are portraits of the founders of this pagoda – Prince Junot and Lok Om. Outside the sanctuary and among the surrounding trees are small colorful statues. Most statues add to the religiosity of the place, especially the images of Buddha, Ruusi and Krishna, while some seem to be playing silly, poking their heads out from behind a tree as though playing Peek-a-Boo. There is also a huge pool outside where most young monks and monkeys hang out. Meanwhile, the other pagoda is Wat Utynieng or Lower Temple. Overlooking the ocean, this equally serene temple sits on a hill on Santipheap Street. What’s unique about this pagoda is the huge reclining Buddha and a building that is specifically dedicated to Ya-Mao, a local deity. Behind the temple’s sanctuary is a group of colorful statues depicting a Buddhist procession. While showing utmost reverence and proper clothing, tourists are always welcome inside Wat Chotynieng and Wat Utynieng.